World Vision are at it again. Among the many undoubtedly good things they do on a scale that HIPPO can yet only aspire to, are the following items in their latest 'Alternative Gift Catalogue'. Once again the accompanying photographs invoke the natural affinity between children and animals to give a misleading aura of kindness to their callous exploitation of the latter. Brighten life for a poor farming family in south-west Kenya. With the gift of four chickens, plus training in breeding and rearing chickens, they'll be assisted in earning an income by selling eggs, and their children will enjoy a healthier diet. £12 £25 buys a chicken coop. Why give another boring woolly jumper this Christmas when you could give a real live ram? He'll help start a sheep breeding programme in Senegal. Families will be able to sell the sheep they produce at market and be able to fund their child's education and healthcare. And giving back some of their first lambs to the programme will help the whole community to prosper. £29. £57 for a ram and a ewe. This rather puerile 'humour' might not be quite so bad as Christian Aid's 'Animal Multiplying Machine' that we saw ad nauseam in their TV adverts this year but does it give you the impression of an organisation that cares about animals? To say nothing of the environment. Or even human health*. I am not surprised at their lack of consideration for the sensibilities or perspective of humanitarian and environmentalist vegetarians in spite of the representations they have received. We must seem an insignificant minority to them the loss of whose support would not be very important - I am not at all convinced that they are right about that. But I am surprised that any vegetarians continue to support them, or the others like them. We certainly wouldn't direct any of HIPPO's money to them, even if they promised to spend it on ethical projects - it would simply release an equivalent sum to be spent in non-vegetarian ways. We would want to see a complete change of heart and direction before we would have anything to do with them. If you would like an emailed copy of my article "Charities that Exploit Animals in the Name of Humanitarianism' just let me know! * 95% of black Africans are lactose intolerant and suffer health problems ranging from mild to severe as a result of drinking cows milk. Any animal milk is an ideal culture for the growth and transmission of pathological bacteria especially in places where hygiene, storage and distribution are difficult. Of all animals that are pathologically threatening to the health of humans, especially in the tropics and especially when kept in close contact with people, the most dangerous are pigs. They might soon be joined by poultry, especially chickens kept in close association with families, as avian flu has already reached the border of Kenya in Sudan. All the new varieties of flu that have ever arisen, including the so-called Spanish Influenza of 1918 that wiped out millions of people, have come from pigs and poultry kept for food. 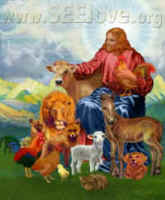 "Feeding the World with Compassion" http://www.ivu.org/articles/net/hippo.html IF YOU DO NOT WISH TO RECEIVE OUR MESSAGES PLEASE TELL US AS WE DO NOT WANT TO BE A NUISANCE TO YOU. SAY WHAT YOU WOULD LIKE TO BE SAVED FROM -- NEWSLETTERS, EXTRA MESSAGES, OR EVERYTHING.